The Thermo Scientific Lab Freezer provides an upright, reliable storage for everyday samples and routine applications. This lab freezer has a 20-cu ft capacity, and has an adjustable temperature range of between −12° to −20°C. The interior of this laboratory freezer has an easy to clean, brightly lit interior, ample storage inside the cabinet and in the door. The exterior of this upright lab freezer resists corrosion and uses environmentally friendly non-cfc refrigerants. 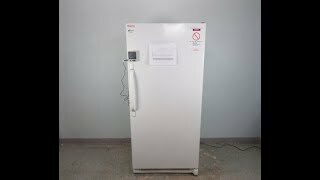 This -20° Thermo Freezer serves basic temperature control needs, and aren’t intended for high value samples, where alarms and monitoring might be needed. This Thermo Scientific -20°C Lab Freezer has been fully inspected and comes with a current temperature validation. This Brand New Scratch & Dent Model has been tested with a clean bill of health by our service team as part of our QC Process. MSRP: $2,445.00, all of our lab equipment comes backed with our standard warranty. Should you have any questions, please don't hesitate to contact us.